Combine Spanish chorizo with your favourite pork sausages and turn them into flavoursome burgers, which are nicely countered by punchy rocket, sweet red pepper and a quick cheat's aioli. Make the aioli by beating the garlic, lemon juice and olive oil into the mayonnaise, then set aside until the burgers are ready. Heat the barbecue or a cast-iron griddle pan. Skin the chorizo and finely chop the meat, then skin the pork sausages and combine the meat with the chorizo, mixing well with your hands. Form into 4 burgers. Brush them with olive oil and cook for 5 minutes on each side until cooked (the chorizo has a tendency to burn so keep an eye on it). Cut each red pepper vertically into 4 panels, then discard the seeds and core. Brush with olive oil and grill on both sides until well-marked. Brush the pitta breads with olive oil and grill on one side until marked. 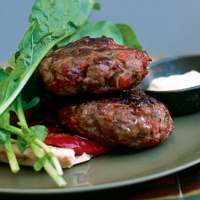 Top each pitta with two pieces of roasted red pepper, a chorizo burger, and some rocket leaves. Serve with the aioli. Argentina’s reds are often a great barbecue choice: they’re made for meat.